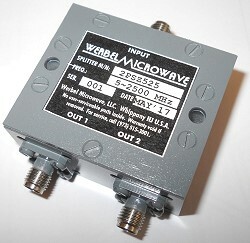 Model 2PSZ525 from Werbel Microwave is a low frequency broadband splitter, covering 5-2,500 MHz in a continuous band. Werbel's own, hand-wound coils make it possible to achieve such broadband performance. Typical SWR is 1.4:1, typical isolation 20 dB across the band. Phase and amp balance is 5 degrees, 0.7 dB max across the entire band. Case measures 1.8x1.5x0.9 inches. SMA or N female options available. Werbel Microwave LLC is a United States based designer and assembler of highly-customized, microwave components. Since 2014, we have been serving the commercial and military wireless industries by developing products specifically for niche applications. We continue to expand our product line to include more general-purpose components. Our current library spans from sub-MHz frequencies up to 20 GHz.